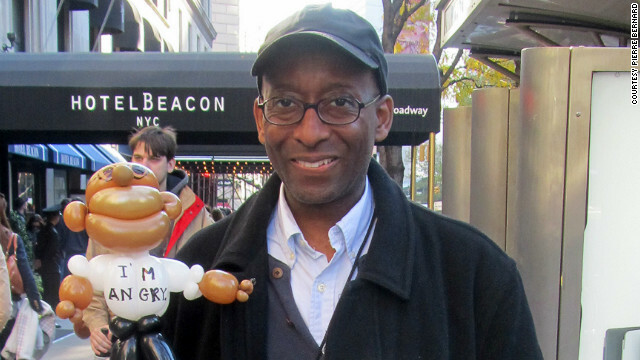 Pierre Bernard poses with a balloon representation of himself. Nowadays, he turns to Facebook to "rage." Viewers of "Conan" have seen Pierre Bernard pop up from time to time, most recently (and memorably) as a lizard last year in a parody of the movie "127 Hours." Bernard is a graphic designer for "Conan" (which airs on TBS, owned by Time Warner, also owner of CNN), so he is responsible for some of the unique art and graphics seen on the show (along with Eric McGilloway and Steve Robinson). He is also a bona fide nerd, who first made his mark years ago, on NBC's "Late Night with Conan O'Brien," in the recurring sketch "Pierre Bernard's Recliner of Rage," where he would "rage" about a particular geeky topic that had been bothering him lately (like the inclusion of Dr. Daniel Jackson on "Stargate SG-1," one of his biggest passions). As he is one of the last people you would expect to go into a rage, viewers loved Bernard's segments. Prior to the "Recliner," after Bernard had appeared on air a few times, he got a call from Brian Stack, one of the show's writers: "We were just talking, and he wanted to know how my weekend went, and he asked if I had any problems lately going on, I told him I had just bought a new iPod and was trying to convert my LP records to MP3 files. He then asked me to write these out and send it to him. I figured I would humor him and write it out. I then got a phone call that I would be reading what I wrote on air, sitting on a recliner. I still had no clue where this was going, and it became an instant hit." The appearances led to a landing a role on "Stargate SG-1" for a few episodes, and he is an annual guest of Dragon*Con's "Stargate" programming. Aside from "Stargate," another passion of Bernard's (and another topic of his "Recliner of Rage") is anime, something that also inspires his artwork. When CNN Geek Out caught up with Bernard a few months ago, he told us he was "rediscovering 'Samurai Champloo.' "
As he explained, "I bought the boxed set two years ago, and it has been sitting among other anime DVDs that I haven't made time to watch, and the other night I said, 'I gotta look at this.' I've only seen what I've seen on Adult Swim, and I know TV always edits things. It's so cool to watch these episodes intact. I'm watching it with the English dub, but at some point, I'll watch it in Japanese with the subtitles. It's such a cool series so far!" However, if Bernard had to pick one true anime love, it's "Ghost in the Shell." "That series makes my imagination run wild. I wish there was a way I could live in that world. The whole idea of cyberizing oneself and downloading yourself into an android - at some point, that's going to happen. I just wish I could live at that time. What if you could live beyond your years and beyond the limitations of your body? I love that. I see the scenes that 'The Matrix' lifted. I love that series." Among other favorites: "Cowboy Bebop," "Oh My Goddess!" (especially for the artwork), and the U.S. series "Justice League Unlimited." Today, Bernard turns to Facebook to "rage," (he said he has a "backlog" of issues to rage about) but he said that if it were ever possible for the "Recliner of Rage" to end up on "Conan," he would love to do it again. I love Pierre! So funny! II want to see this guy battle Blackwolf the Dragonmaster! There can be only one! Ghost in the Shell, Cowboy Bebop, and Samurai Champloo are in my top 5 anime for sure, love those series. Dude has taste. MrBadMood.blogspot.com, though on an irregular basis does it so much better! MrBadMood is a potty mouth and a little baby.